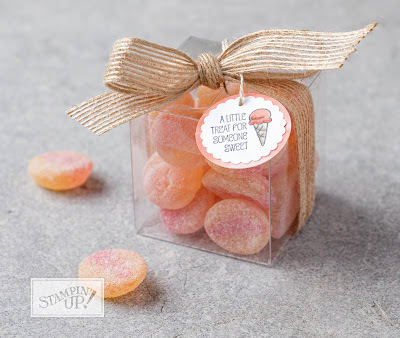 Stamped Sophisticates: Valentine Acetate Tiny Treat Box from Stampin' Up! Valentine Acetate Tiny Treat Box from Stampin' Up! One of my favorite items in the Stampin' Up! catalog is the the Clear Tiny Treat Boxes -- these are clear acetate 2" X 2" X 2" boxes that are just the right size for treats, and they are so much fun to decorate. I've used the sample on Page 10 of the Occasion catalog as my starting point. The catalog shows the box decorated for a birthday. I've decorated mine for Valentine's Day. The other new item I'm using from the Occasions catalog are the new Sweet Soiree Ready Shreddies. This comes in 3 colors of crinkle-cut shreds --dark pink, silver and white-- perfect for gift bags or boxes. The clear acetate boxes come flat and easily fold together. They come with a protective covering, which should be removed before decorating. For the treat box I used a pattern from the Sweet Soiree Specialty Designer Series Paper from the Occasions catalog. I cut a two 3 X 3 inch pieces of the DSP and scored it at 1/2 inch on all four sides. Then I cut up to the score lines one two sides. Since the base won't be opened, I used Fast Fuse to create the base and adhere it to the bottom of the box. Then I added the dark pink crinkle-cut shreds and a Lindt Chocolate Truffle and I closed the box. To create the top, I only glued the sides together and then placed it loose on the top of the acetate box. The ribbons would hold the top piece in place until the recipient removed the treat inside. Then I used the heart dies from the Sweet & Sassy Framelet dies to create a heart out of Silver Glimmer paper and another out of Berry Burst Card stock. I used the Bloomin' Love stamp set to stamp a sentiment in Berry Burst ink, punched it out using the Classic Label punch, and attached it across the two hearts with mini dimensional. I added a small rhinestone to the sentiment, and attached the hearts using a piece of Silver Baker's Twine from the Occasions catalog. I wrapped the box with Berry Burst 3/8" Metallic Edge Ribbon tied in a bow on top. Below is the backside of the box, showing how well the new shreds match the Berry Burst ribbon. These little square acetate boxes are a must-have to have on hand for fast, cute treats when you need to give a little gift or sweet treat. Below is a treat box without the top and bottom wrap. Stay up-to-date with new card ideas by subscribing to my blog, register on my Meetup site for notification of future classes, or follow me on Instagram. Do you have the current Stampin' Up Catalogs? To download a free copy of the Occasions catalog and the Sale-A-Bration Catalog, click here. Sale-A-Bration runs until March 31 and happens only once a year. It's typically the best time of the year for you to buy Stampin' Up! products because every $50 order earns you a free gift selection. It's also the best time of the year to join Stampin' Up! as a demonstrator. Earn Free Gifts. During Sale-A-Bration, place an order for $50 and you'll earn a free selection from the Stampin' Up! Sale-A-Bration brochure. 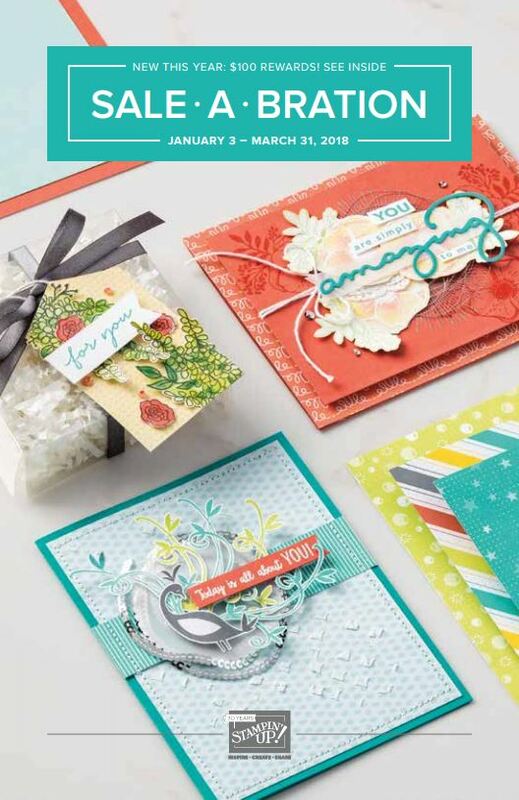 Free paper; free scrapbooking cards, free stamp sets; free ribbons. You'll love the selection. This year there are two levels of free gifts. Order $100 and select from an additional level of free gifts. 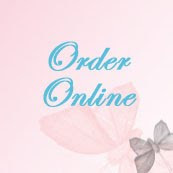 Sale-A-Bration orders can be placed between January 3 to March 31. Qualify for free gifts with orders from the Occasions Catalog or the main Yearly Catalog. 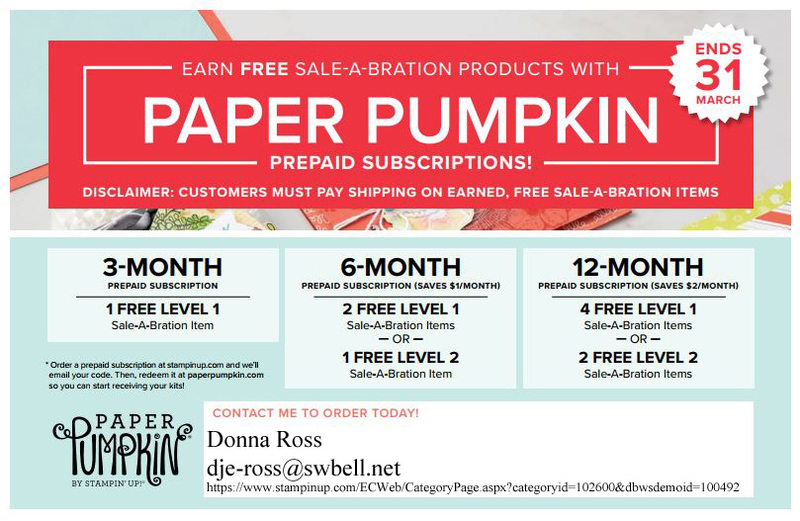 A Paper Pumpkin subscriptions for 3 months, 6 months or 1 year also qualifies you for free selections. Have a large Wish List? 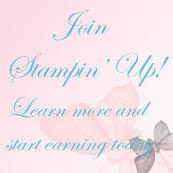 Think about joining Stampin' Up! as a demonstrator. If your wish list from the Occasions catalog is over $99, you can join my team as a Stampin' Up! demonstrator, and take advantage of sign-up savings, plus earn two free stamp sets! Add it all up and for your $99, you'll get up to $226 in merchandise, and you'll save by purchasing your future orders at a 20% savings as a demonstrator. You can use your discount as a hobby demonstrator and never sell a thing. Or you can set up your own business and work the hours your want to work and earn from what you sell to others. This is a great time to purchase the Blends alcohol pens and color lifter and select two free stamp sets -- an incredible savings. Join as a hobby demonstrator to take advantage of the discounts, or set up a business to earn extra money for family vacations, or to save for something big. And all the while, you'll enjoy what you're doing! Ready to place an order or join? 4. Is your wish list is over $100? The $99 Starter Kit is one way to save on your purchase today, and save even more on future orders. You can order $125 worth of product for $99 plus two free stamp sets until March 31. After your initial $99 order for merchandise you select from anything in the current catalogs, place an order for the remainder of your wish list as a demonstrator, and save 20% on future purchases. Need help building your shopping list? Give me a call and we'll work through your starter kit order together. 6. Clearance Rack items - while quantities last. 7. Order current or previous Paper Pumpkin monthly craft kits.